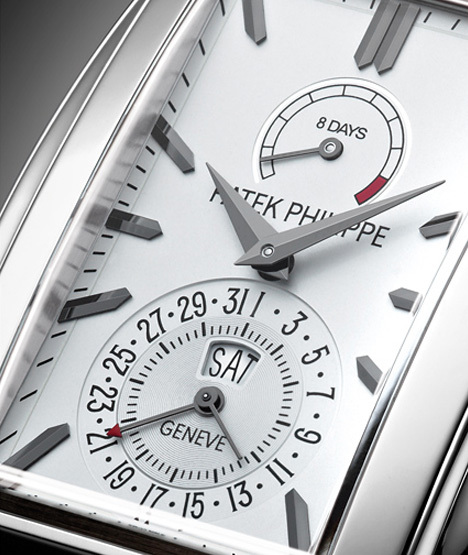 For the new Reference 5200 Gondolo 8 Days, Day & Date Indication, unveiled at BaselWorld 2013, Patek Philippe developed a new manually wound calibre delivering a remarkable power reserve of 8 days. The twin in-line barrels store the power needed to guarantee that it will run non-stop for 192 hours but the result is also due to the patented oscillator with a Spiromax® balance spring and a Pulsomax® escapement which, being friction-free, do not require lubrication, so saving energy each time the lever contacts the escape wheel. Additionally, the extremely hard, totally anti magnetic and corrosion-resistant Silinvar® material is two-thirds lighter than steel, which further optimises the energy balance. The new calibre is housed in an anatomically curved rectangular case in white gold reminiscent of the Art Deco style. The screwed case back incorporates an anatomically contoured sapphire-crystal insert, and the crystal that protects the dial is ground to a convex shape that follows the silhouette of the case without any visual distortion. Note the “trompe l’oeil” effect used for the going train bridge, which at first sight might seem to be an ensemble of three separate curved bridges. 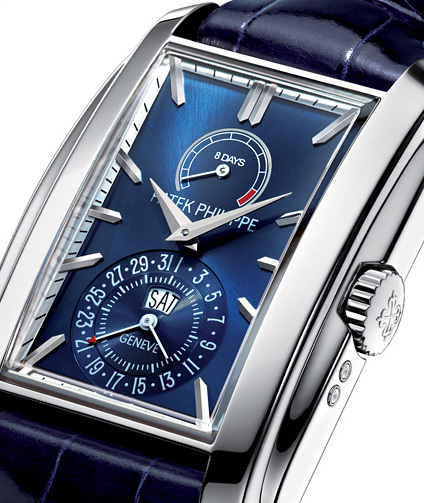 The dial is available in blue sunburst or silvery white. The faceted white-gold hour markers, just like the hands, are mirror-polished for the blue dial and blackened for the silvery opaline dial. 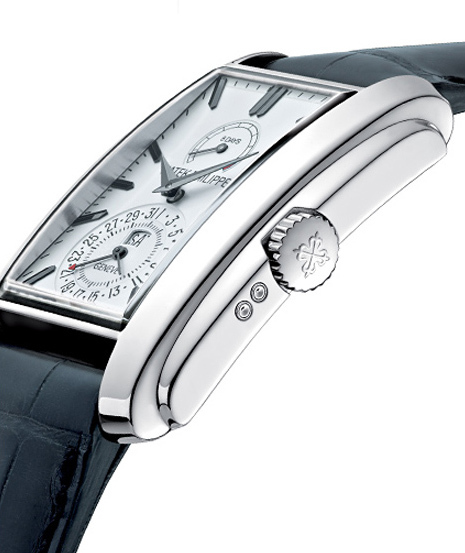 Emphasising the ninth day in red to remind the owner to wind the mainspring, the 8-day power-reserve indicator occupies the upper half of the dial. Its lower half is reserved for the calendar functions, featuring a 31-day scale for the date and an aperture for the day of the week. The calendar is an instantaneously switching mechanism in which the day and the date switch forward simultaneously at midnight, within three milliseconds. 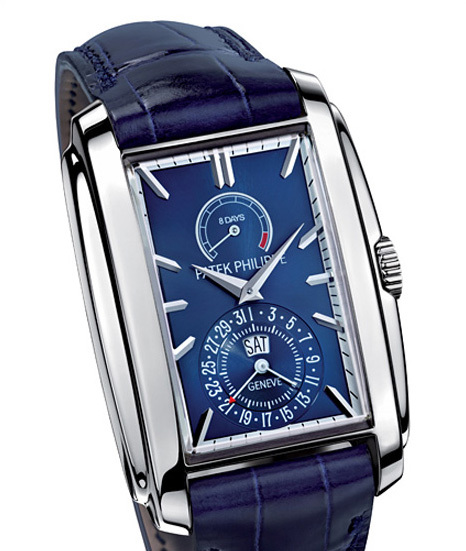 The new Patek Philippe Ref. 5200 Gondolo 8 Days, Day & Date Indication is worn on a hand-stitched alligator strap with large square scales, which is secured with a white-gold prong buckle. The strap is shiny blue to match the blue dial and matt black for the model with the silvery white dial.